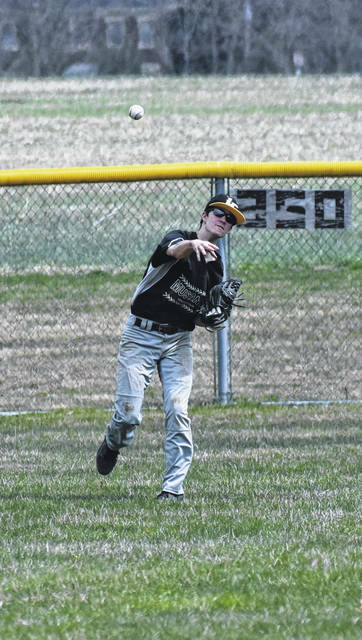 Lynchburg-Clay Senior Damin Pierson throws the ball from centerfield at Lynchburg-Clay High School on Saturday where the Mustangs took on the Rockets of Clermont Northeastern in a non-conference matchup. The Lynchburg-Clay Mustangs varsity baseball team suffered it’s first losses of the season on Saturday when Lynchburg fell to the Clermont Northeastern Rockets 11-6 and 9-3 respectively in a home double header at Lynchburg-Clay High School. The Rockets took control early in the first game and scored one run in the first and one run in the second as the visitors took a 2-0 lead into the top of the third inning. Clermont Northeastern blew the game open in the top of the third when it scored four runs and took a 6-0 lead that it would not relinquish. The Mustangs answered with two runs of their own in the bottom of the third inning when Josh Wolfe drove in Briar Bourne and Drew Pitzer to make it 6-2. Both teams score three run in the fifth inning to bring the score to 9-5 after five. The Rockets plated two runs in the top of the sixth inning and Lynchburg-Clay had one in the bottom of the sixth to provide the final margin of victory for the Rockets. In the second game of the double header both teams came out with hot bats and combined to score seven runs in the first inning. The Rockets struck first and scored four run in the top of the inning to take a 4-0 lead. Lynchburg-Clay scored three in the bottom of the first with the initial two runs being driven in on a single by Wolfe that scored Bourne and Damin Pierson. Wolfe scored the third run later in the inning on an error by the Rocket’s centerfielder. Both teams cooled off quickly and neither team was able to score a run in the second and third innings. The Rockets got back in the scoring column with two in the fourth and had one run in the fifth, sixth and seventh innings to provide the final 9-3 score.